Are you thinking about residing your home? We’d like to share with you the features and advantages of James Hardie’s HardiePlank siding that we think you’ll agree make it the right choice for your new home exterior. Hardie siding is the most popular siding choice in the United States, and it’s not hard to understand why. Water can do extensive damage to home exteriors, especially to wood and vinyl siding. It can cause mold growth and eventual rotting, and you might even see your siding warp, expand, swell, or crack. James Hardie siding is made of cement, sand, and cellulose fiber and is resistant to moisture and the damage it can cause. Unlike wood and vinyl, Hardie siding is noncombustible. It does not ignite when exposed to flames, nor act as an accelerant. Your home insurance company may even give you a discount because you use Hardie siding. Insects, birds, and other unwelcome guests won’t be able to make themselves at home if the exterior of your house is covered with Hardie siding. They won’t be able to peck, chew, or dig their way through it. Whatever Mother Nature brings to your house—blizzards during the winter, heat and dry spells in the summer—James Hardie siding can handle it all. Hardie has spent time studying the long-term effects of climate on siding in different regions of the country and created the Hardie Zone system to ensure that you get the right siding for your home, no matter where you live. We’re in Hardie Zone 5: our temperatures vary widely and we have precipitation year-round, but none of that is a match for Hardie siding. While wood is beautiful, it is easily damaged by moisture, fire, insects, and the weather. With James Hardie siding, you’ll have the option to give your home’s exterior the appearance of wood with none of the hassle of actual wood. 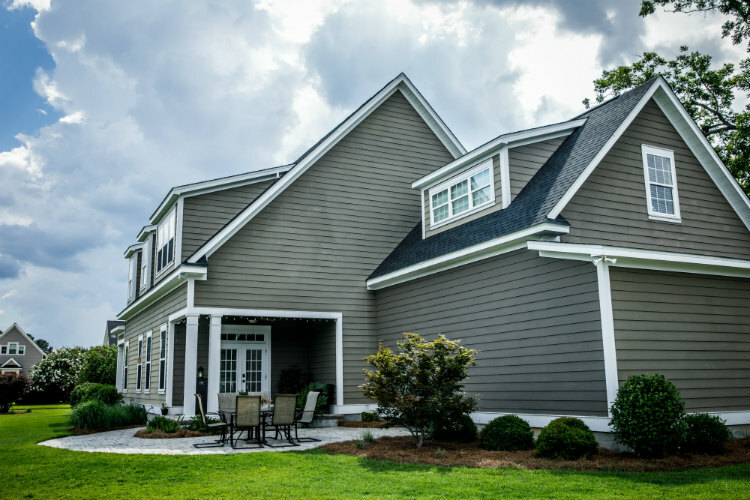 James Hardie’s ColorPlus technology involves multiple applications of their proprietary finish to the siding. They cure it between coats to ensure that the finish stays bonded. It won’t fade, peel, chip, or crack. Cleaning your home’s exterior may seem like a daunting task. James Hardie siding makes it manageable. Just power-wash it every few years, and you’re good to go! You’ll need to decide what color you want your siding to be, and you’ll also need to decide on texture. HardiePlank Lap siding comes in four varieties: Cedarmill, which mimics the texture of wood, and Smooth, which does not have the appearance of wood grain. You can choose either type and get it with or without a rounded beaded edge along the bottom of each plank, which gives it a nice, finished look. Check out the other styles of Hardie siding that are available: HardieShingle, which mimics the look of wood shingles, and HardiePanel, which is vertical siding. You can mix and match the siding and the colors to get a look that will make your house stand out from the others on the block! Complete your home’s unique look with HardieTrim and HardieSoffit. Have questions? Ready to get started on your residing project? Please call Siding & Windows Group at 847-251-4200 or contact us for your free siding quote!